I want to share this video uploaded to YouTube by Uniregistry, the company founded by Frank Schilling that is applying for hundreds of new gTLD strings. In the video, you can get an idea of Frank’s vision for the Internet once new gTLD domain names become available and used. There is considerable uncertainty right now, but one thing is certain for me. It’s been very cool to watch the Internet change right before my eyes. There will be winners and there will be losers. Fortunes will be made and lost. It’s been exciting to see all of this unfold in front of us. The Internet as we know it is changing, and it’s going to cause great change in our businesses. Frank Schilling is a big proponent of gTLD domain names, and he has invested millions of dollars into his company, Uniregistry. Not only is Uniregistry physically expanding in Grand Cayman, but the company is also hiring. According to a promoted article on CircleID, Uniregistry is looking to hire a number of employees in different areas of expertise. Whether you are a developer, engineer, or are in the field of marketing, there may be a job opening that suits your skill set. According to the article, Uniregistry is looking to hire Software Developers, Systems Specialist, Front-end Developers, and Marketing People. The one caveat to this is that employees must be based in Grand Cayman, so you should expect to move to the Caribbean if you are going to be hired. If I was new to this business, wasn’t married with a child, and/or I was looking to work for someone else in the domain space and had a matching skill set, I would probably consider learning more about the job openings at Uniregistry. We are in a time of massive change to the Internet, and I think Uniregistry is going to be one of the companies at the forefront of these changes. Frank is clearly one of the smartest guys operating in the business, and it would be very cool to be involved with gTLDs from nearly the beginning. I have no idea when gTLDs will be adopted by consumers or if gTLD domain names will make good investments, but I think we are in a unique period of time right now. Working for a cutting edge company, located in paradise, at this time, seems like something that is going to be a cool experience no matter what happens with these new extensions. If you are looking to do something cool, take a look at some of the opportunities Uniregistry is currently offering. According to a news report on a Grand Cayman-based local television station, Uniregistry is expanding its physical footprint. 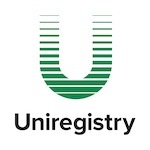 Uniregistry is the company founded and funded by Frank Schilling, and it applied for 54 gTLDs. The report focused on the closure of a popular Brazilian churrascaria-style restaurant called Prime, and it said that the restaurant’s next door neighbor, Uniregistry, will be taking over the space. I think it says something that Uniregistry is expanding well before gTLDs are awarded and available for public purchase. Whether the company has already overgrown its current office space or if it is ramping up to bring on additional employees and add equipment, it’s great to see expansion in the domain space. Thanks to Bret for sharing the news.